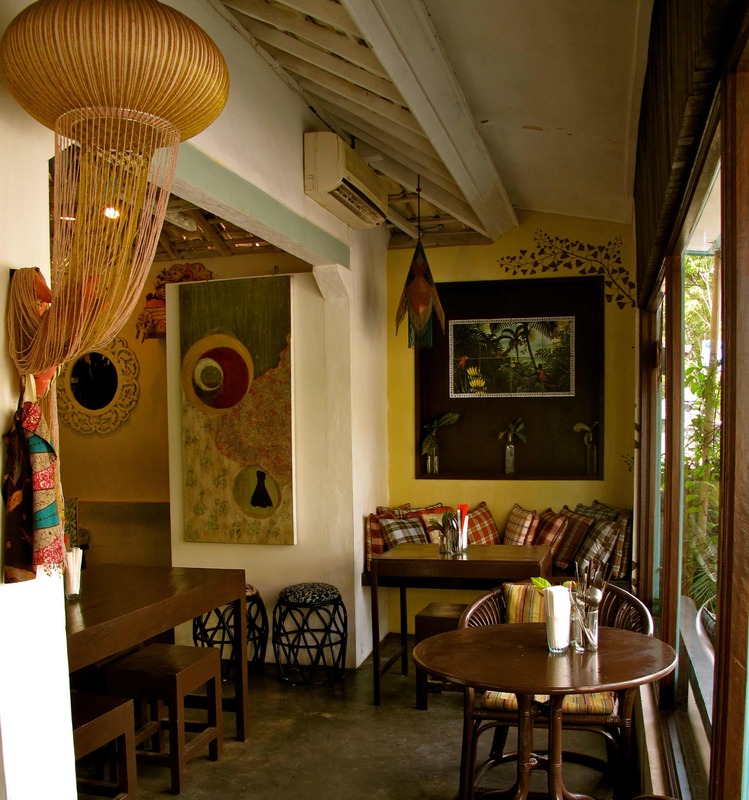 With its homely atmosphere and quirky charm Green Ginger Noodle House provides a much loved vegetarian sanctuary. The cafe is a collaboration between Britta Boyer, a designer with a penchant for vintage, and Jonathan Russel, well known on the island as DJ Rock Solid. You can still find him mixing it up at Ku de ta, but these days you are more likely to find him indulging in his passion for creating good food that is also good for you. A hotch potch of styles and influences are at play, creating a unique space. Food is firmly of the Asian vegetarian persuasion; the vibe is quaint tea house – think ornate china tea pots, floral wall paper and tiered cake stands; while a vintage clothes rail, retro beaded lamps and bird themed art work create an antique feel. Much of the bric a brac, including the stamp collections, second hand books, and funky furnishings are also for sale. An enchanted garden out back is filled with dappled sunlight, frangipani, scatter cushions, hanging plants and tinkering chimes, definitely a place for lingering. The picturesque Balinese temple that looms over the garden provides a fitting backdrop. What Green Ginger lacks in space, it makes up for in spirit. This is a cafe with soul! As Jonathon explains, he hopes to add “Positive energy as well as fresh flavours to the local food scene.” The cafe certainly isn’t going to change the world, but does act as an inspiration to others with its thoughtful environmental practices. Apart from Italian coffee, almost everything is sourced locally, and all dishes (including sauces and curry pastes) are made from scratch. A keen gardener, Jono has also been known to put together field trips to visit suppliers in Bedugul so visitors can learn about organic farming. He is also committed to recycling, sustainability and minimal impact, encouraging customers to bring their own containers for take away. In the spirit of community, local Balinese receive hefty discounts, and weekly free Indonesian classes help teach foreigners the lingo. Good ethics aside, Green Ginger also served up fabulous food. I have been hooked on the Laksa since I first discovered the cafe a few months ago. Prepared Singapore style, this deeply aromatic coconut curry soup is thoroughly intoxicating, served with just a hint of chilli, wedges of tasty tofu, wilted bokchoy and sprigs of fresh dill. Big, fat Rice Paper Rolls are equally moreish packed with fresh vegetables and just a hint of mint, dipping sauces include a light and fragrant homemade peanut sauce. Tofu Puffs are delightfully fluffy, while Crunchy Corn Fritters are made with the plumpest corn kernels that really do burst with flavour, and are lovingly enhanced with thick homemade chilli jam. Salads include Yasai Sarada, a Japanese vegetable salad with seaweed, and the Mango Avocado Salad combining greens with the sweetness of mango and the crunch of snow peas and bean spouts. 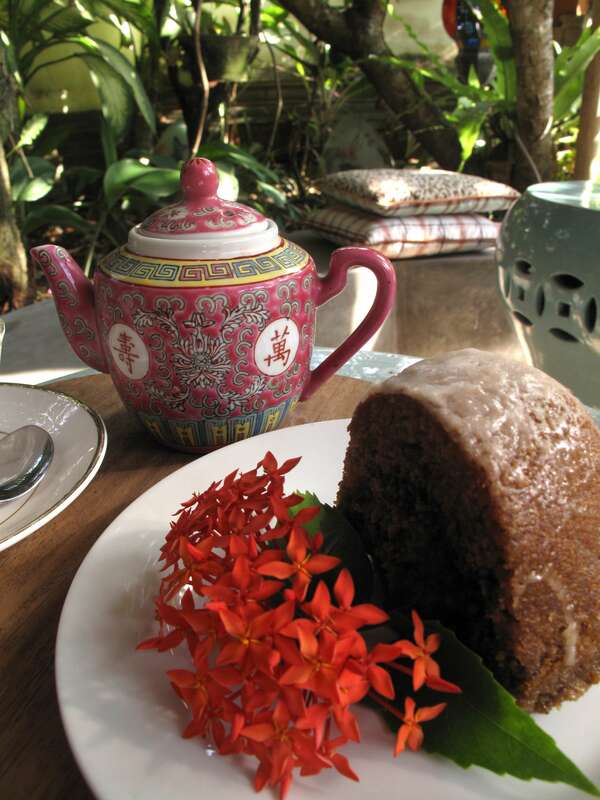 Don’t even think about leaving without trying the Coffee, Cardamom and Ginger cake – it is truly extraordinary, even better when enjoyed with a pot of authentic chai.